The New England Aquarium - situated along the recently rejuvenated waterfront, the Aquarium offers a variety of indoor and outdoor exhibits. Enjoy a family romp up and down the spiral staircase to see the unique five-story aquarium filled with giant sea turtles, barracuda, and sharks! Admission is currently $22.95 for adults, $20.95 for seniors over 60, $15.95 for children (ages 3-11), and kids under 3 are free. Check their website for hours and combo ticket prices! The Boston Children's Museum - the premier place for children (and their parents!) to experience the fun of learning. The museum boasts three floors of exciting exhibits and activities, and features a three-story climb, light-up dance floor, science playground, and art studio. The museum also holds a number of cultural, scientific, and environmental special events throughout the year. Admission is $12.00 for adults, seniors, and children (children under 1 year old are free); check the museum's website for hours and information on becoming a member! Freedom Trail - a 2.5 mile red-brick walking trail that takes you throughout the town to 16 nationally significant historic sites; including such favorites as the Old North Church, the USS Constitution, and the Bunker Hill Monument! The trail offers visitors the opportunity to explore a unique collection of museums, churches, meeting houses, burying grounds, parks, and historic markers that tell the story of the American Revolution and beyond! Check out their website for specific tour details and pricing. Fenway Park - visit the park where today's stars thrill the Red Sox Nation! The park where Babe Ruth pitched, The Kid hit, and Yaz dazzled is a "don't miss" for baseball fans! Don't fret if you can't get game tickets (which are nearly impossible to come by! ); try the Fenway Park Tour - a 50 minute historic walking tour of the ballpark, guided by an official Fenway Park Tour Guide. Tour rates for 2012 (beginning April 9th) are $16.00 for adults, $14.00 for seniors, and $12.00 for children ages 3-15, military personnel, and students. For more tour info check their website! Faneuil Hall Marketplace and Quincy Market/Haymarket - these nearby sites offer some of the best and most colorful shopping to be found in Boston! 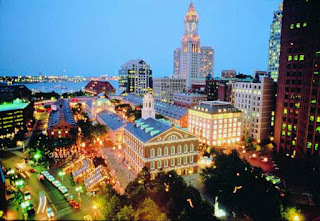 Faneuil Hall Marketplace and Quincy Market combine the glories of the past and the vitality of the present with over 50 shops, 14 restaurants, 40 food court stops and regular street performances (think clowns, magicians, contortionists, and musicians!). Haymarket is Boston's great outdoor market held most Fridays and Saturdays, where you can buy everything form produce to fish just off the boat at prices so low you'll do a double take (and check out Haymarket out on Facebook)! The Hood Milk Bottle - this giant milk bottle sits next to the Boston Children’s Museum. Built in 1930 by Hood Dairy, the structure was moved to its current spot in 1977. The bottle hosts an ice cream stand and snack bar during the summer! Leonard P. Zakim Bunker Hill Bridge - hailed by the Discovery Channel as one of the world’s top 10 best bridges, it's the widest cable-stayed bridge in the world and the only asymmetrical bridge in the US! The concrete towers resemble the Bunker Hill Monument, and the cables are lit with ethereal blue lights after sunset. The Boston University Bridge - perhaps the only place in the US where, simultaneously, a plane can fly over a car driving over a train traveling over a boat! Larry Bird's Bronze Sneakers - check out the bronze casts of this Boston Celtics legend and NBA superstar at Boston’s Faneuil Hall Marketplace,also features a list of Bird’s career accolades! The "Skinny House" - measuring a mere 10 feet wide and 30 feet deep, this four-story house is rumored to have been built out of spite to block the light from reaching the neighbors living behind it! With so much to see and do, Boston is one of the best US cities for a family getaway. No matter how you decide to spend your time exploring the city, there is something to captivate the minds and hearts of every visitor. Stay tuned for the Travel-Tot "Tip of the Week" next Tuesday for an amazing family-friendly lodging option for your Boston adventure! Pack Your Car Like a Pro! Separation Anxiety: Out and About!